My husband, Paul and I put a lot of back breaking work into this rock garden. We lugged these big rocks from out Uncle's farm. Dug the earth by hand, added tonnes of black earth and mulch. Then the fun part started as we planted our perennials. 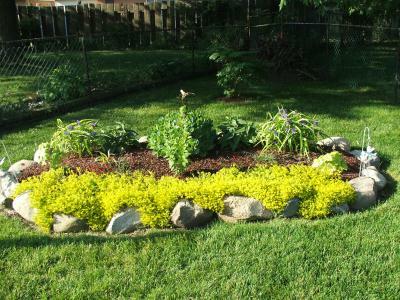 We planted lilyturf, dianthus, platycodon, sedum yellow, heucherella, epimedium grandiflorum, blackeyed susan, sedum pink, and spiderwort. We surrounded all the flowers with cocoa bean shells. It's beautiful now that it's filling in. We get blooms in the spring, summer, and fall! Back breaking work pays off. Good job guys. What a lovely site. It would be so relaxing to sit on a warm sunny evening and just look and enjoy all that beauty.